A COUPLE who evacuated their 40acre property on Deepwater Road on Sunday afternoon have told of the intensity of the fire which ripped through Deepwater National Park. Bob and Debra Wait, along with their 2 dogs escaped the inferno after being encouraged to leave by authorities. At first Bob said he was reluctant to leave, but when he saw the fire arriving just knew he had to go. "It's a horrible feeling, it's just something you hope you never have to do," he said. "When they first said you had to go I ran down and got the water pump going and put sprinklers on to try and get it safer and keep it wet, and then the fire was like a thunderstorm, the noise that was in it. "In the neighbours back paddock you could see all the fire starting in there and then all the stuff falling out of the air on fire. "It was thundering and roaring and you could see it coming." The couple tried to save as much as they could before leaving the property, with a number of livestock being left behind. It was difficult enough just getting the family pets out. "We hooked the van to the car and just took off," Bob said. "One of our dogs, we tried to get her in the car and she wouldn't get in, but she beat us down to the road. "I looked at her and said you gotta get in, and thankfully she hopped in." Bob and Debra who have lived in the property for 14 years say they have never seen a fire so intense. 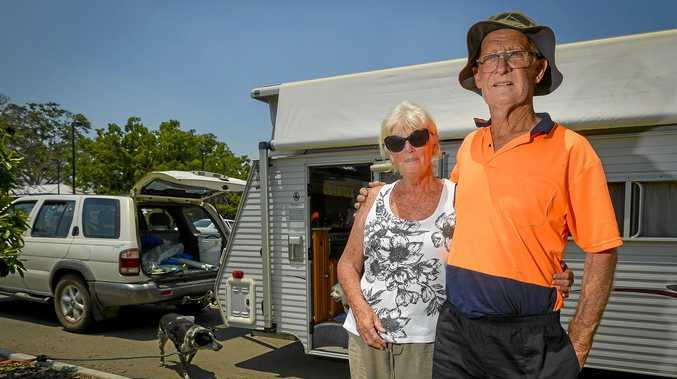 They are now living in their caravan opposite the Miriam Vale Evacuation point where staff continue to come and check on them. It's a nervous wait for the pair whose closest family are in Yeppoon or Nambour. They say the hardest part is the not knowing as well as not being able to do anything about it. "My mate up the road he has a lot of bees and his place has been completely wiped out, we don't know how he is or anything," Bob said. "To just see the paddocks almost exploding, it was hot, the heat got very intense.